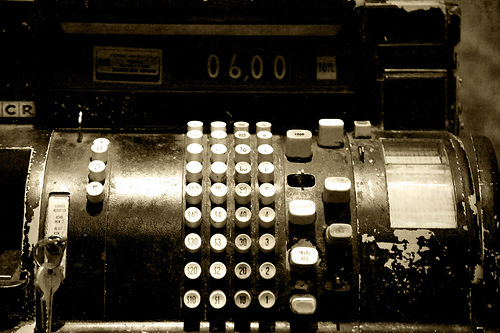 media is, but did you know that social media can also be a wonderful sales channel? It’s True!! And, why not…. in order to bring about a sale there needs to be consumer trust. And, what is the best way to earn trust?! Social Media is powerful. Consumers are in more control than ever before. The large companies are no longer the power-houses…. it’s the consumers. And, do you know why? Because of Social Media…. Because of Social Media Communities like Twitter. Twitter is an amazing social media community that brings the power of the people together to talk about everything and anything in real time…. and they are. Here are a few methods Companies large & small are taking advantage of Twitter as a Sales Channel. Check out their strategies & see which one is the best strategy for your business. 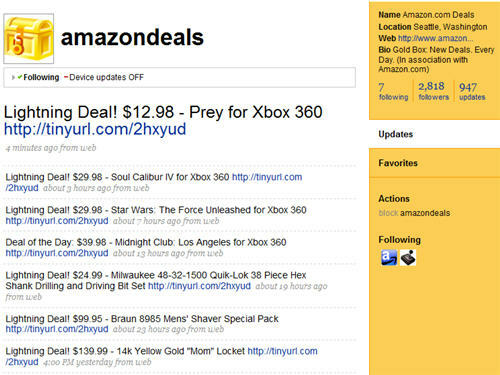 @amazondealsThese are the companies that only tweet links to their deals & promotions. That is pretty much it. Most companies couldn’t get away with something likes this, however, it appears Woot and Amazon have earned their trust and respect already on their eCommerce websites to be able to do this.Keep in mind that Social Networking sites like Twitter are communities that thrive on conversations. “The Sweet Deal Shouter“ are shouting out links & not conversing at all, but seem to do amazingly well. They have earned relationships with their consumers. Amazon has some other cool profiles… Like one that will check on the Wii every second to see if they are available for purchase. It is a great way to assist consumers on finding the product for the Holidays. Dell on TwitterDell is on Twitter in a major way. But, they don’t use Twitter the way most do…. with conversations. They use Twitter very much like “The Sweet Deal Shouter” above. However, the difference is that “The Structured Informer” uses Twitter as a sort of news feed for its followers. For example, if you are looking for Dell deals there is the Dell Outlet. If you are looking for deals for the small business or deals for the home…. they have Twitter profiles for just those deals. Or, maybe you are a gamer that wants to keep up with the updates for that type of news they have that too. 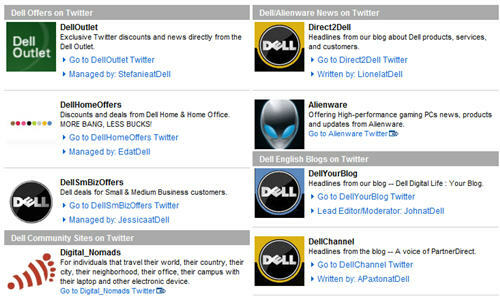 Dell has about 17 different Twitter profiles that you can follow for those particular type of news. There are many choices for its Consumers. Why is this a good idea?? Consumers can use their different Twitter profiles as a type of New Reader…. as a way to keep up with Dell News specifically that interests them. Less Noisy – Just hear the news you want to hear & ignore the rest. This is great for large businesses to keep people informed real time. @buildabearThese companies’ online presence might be smaller than the other mentioned companies, but they understand the importance of social media conversation. They don’t just tweet their deals and promotions…. they converse. Through their conversations with consumers they are building relationships and earning trust. They are answering questions. Basically, they are using Twitter for Customer Service. When they tweet their deals and promotions they are making sales. They are earning these sales because they have earned the consumers trust….the good old fashioned way. Sure, it has a modern social media spin on it. But, the basics are the same. Earn the consumer’s trust = more business. Tons of customer service… better than what you might get in person. Great Word of Mouth Marketing… real time. Clear up their mistakes publicly. @zapposZappos is one of the large companies that understands the importance of Social Media as a Consumer as a well as a Company. 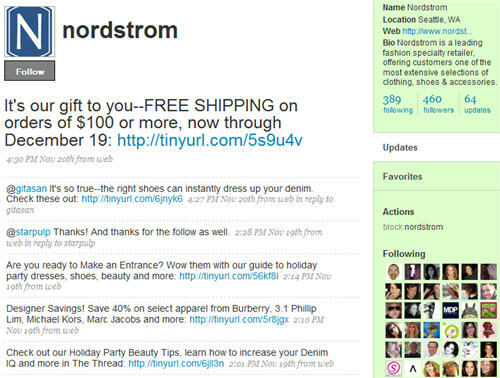 It is using Twitter to the extreme & thriving.Zappos even dedicated an entire website just to their twitter presence. 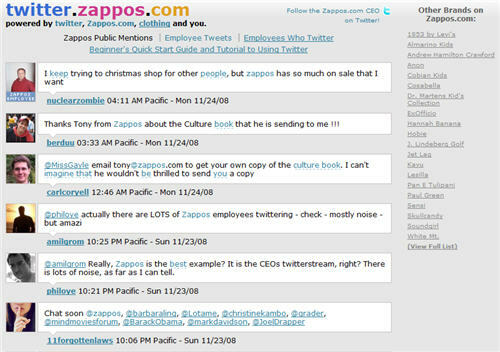 The site is broken down into what others are saying about Zappos; What employees are talking about; What the CEO and COO are talking about; and even links to what people are talking about regarding the brands they sell at Zappos. Online Customer Service at its best!! Converses about everything…. not just limited to the business, but everything. Pics…. personal pictures that show their real side. Created an entire website dedicated to Twitter…. Twitter discussion from employees, customers and their brand. You can see that all of the above companies are using Twitter differently. They all have their reasons & strategies to do what they are doing. But, most of us are not large companies like Amazon and Zappos. So, what do I think is the best strategy for the average small business? I think the perfect combination is the “Little of This Little of That” Strategy. It is a great way to earn a consumer’s trust through interaction, conversation and wonderful customer service skills. What Twitter Strategy are you going to use? Chris Byrd helped a customer (Todd Sullivan) via Twitter. We do this all the time and encourage other companies to do the same. Your quick comment here also shows you guys have done your homework when it comes to relationship management. @Sean McDonald – That’s awesome. I didn’t see the Chris Byrd Twitter Profile listed on your list of Dell Profiles at http://www.dell.com/twitter to contact with Dell questions. I’m glad that Dell has someone like Chris Byrd helping customers via Twitter & I’m thrilled to hear that helping customers is important to Dell and being done via Twitter. Nice post. I am big twitter fan and always thinking of beneficial ways to use this medium. Glad I could join your conversation. This is definitely the best article about Twitter and real business with real $$$ income. Maybe you find this information interesting to your article. 1. One day, four travel deals. Only for twitter followers!